Author(s): Y.L.N. Murthy, Praveen Choppara, Y.V. Prasad, T.J.U. Ranjan. Department of Organic Chemistry, Foods, Drugs & Water, Andhra University, Visakhapatnam, 530 003, India. 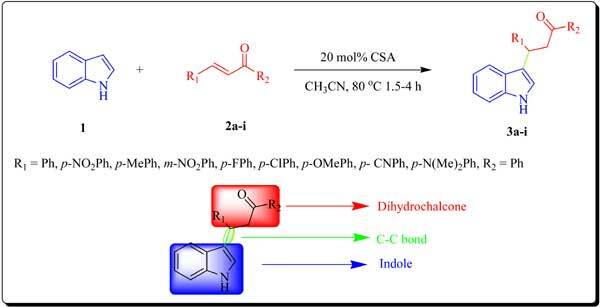 Herein, we report cellulose sulfuric acid (CSA) as a heterogeneous, eco-friendly, reusable catalyst for the synthesis of β -indolylketones via conjugate Micheal addition reactions of indoles, to chalcones in acetonitrile at 80 °C for 1.5–4 h. The structures of the synthesized compounds were evaluated by spectral data. All the synthesized compounds were screened for their antimicrobial activity against bacterial (S. aureus, K. pneumonia and S. marcescens) and fungal (C. albicans and A. niger) strains. The aim of this study was to determine the relationship between lipophilicity and antimicrobial activity of β-indolylketones. Keywords: β-indolylketones, cellulose sulfuric acid, chalcones, indoles, in vitro antimicrobial activity, lipophilicity, michael addition. Affiliation:Department of Organic Chemistry, Foods, Drugs & Water, Andhra University, Visakhapatnam, 530 003, India. Keywords:β-indolylketones, cellulose sulfuric acid, chalcones, indoles, in vitro antimicrobial activity, lipophilicity, michael addition. Abstract:Herein, we report cellulose sulfuric acid (CSA) as a heterogeneous, eco-friendly, reusable catalyst for the synthesis of β -indolylketones via conjugate Micheal addition reactions of indoles, to chalcones in acetonitrile at 80 °C for 1.5–4 h. The structures of the synthesized compounds were evaluated by spectral data. All the synthesized compounds were screened for their antimicrobial activity against bacterial (S. aureus, K. pneumonia and S. marcescens) and fungal (C. albicans and A. niger) strains. The aim of this study was to determine the relationship between lipophilicity and antimicrobial activity of β-indolylketones.